The police said that the accused managed to prepare at least 400 to 450 fake passports and succeeded in getting a visa for some of their clients. 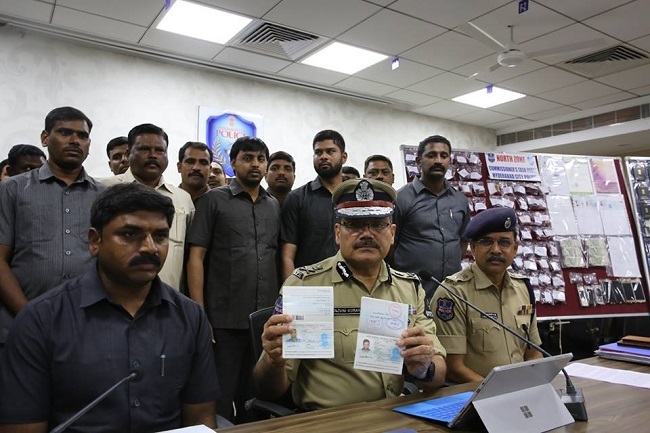 In a major bust, the Hyderabad city police uncovered a racket that was involved in passport fraud with the arrest of five people on Monday, including one person, who operated an illegal visa consultancy at Sana Palace in Saidabad. The accused have been identified as Mohd Abdul Raheemuddin, Mohammed Shaik Illiyas, a native of Tamil Nadu and Syed Omran, Mohd Zaheeruddin and Khaled Khan, who reside in Hyderabad. The police said that while Raheemuddin and Khaled were involved in preparing the fake documents, Shail Illiyas would manipulate passports and visas. While Syed Omram would design monograms and logos, Zaheeruddin arranged for the fake rubber stamp maker. The police said that they would collect almost Rs 3.5 lakh to Rs 4 lakh from each client for the whole process and distribute it amongst themselves. “The associate Mohammed Shaik Illiyas is a native of Chennai. He obtained authenticated passports through his agents at Chennai and then tampered with the details replacing the names and other required details by manipulating the original data on the passport. He also removed the first page of the passport and affixed the required client’s photo and signature on the passport,” the police said. “Accused Syed Omran is DTP operator and running a business offering illegal designs of rubber stamps of government officials and letter heads of companies and hand it over to the prime accused for a commission,” the police added. The police said that the main accused managed to prepare at least 400 to 450 such fake passports and succeeded in getting visa for some of their clients. In the process, they were estimated to have made an illegal profit of Rs 1 crore. The police said that they seized 88 Indian passport belonging to clients, 3 fake passports, 2 forged and tampered passports, 130 fake rubber stamps, a Laptop, a scanner, two printers, 7 mobile phones, 2 pen drives and Rs 3,12,000 in cash.